The Board of Governors of Nipissing College is one of the two governing bodies of Nipissing University, the other being the Academic Senate. The Board was established in 1966 by the Executive Council of Northeastern University. When the College was granted a university charter in 1992, the <i>Nipissing University Act</i> established the Board of Governors as one of the two legislative branches of Nipissing University’s bicameral governance system. The records in the Minutes Series were in the custody of the Board of Governors Secretary until they were transferred to the Archives in August 2014. The custodial history of the other records is unknown. Fonds documents the functions and activities of the Board of Governors, including its standing and special committees, and the Board's predecessor, the Executive Council of Northeastern University. Fonds is arranged into series based on committee or documentary type. A number of files and items are not part of any series. Fonds predominantly contains minutes, agendas, correspondence, memoranda, reports, budgets, speeches, membership lists, and financial statements. Records in the Minutes Series were transferred by Susan Robineau, Board of Governors Secretary, in August 2014. Photographs in the Photographs Series were transferred by Sandy Landriault in January 2015. The source of the other records in the fonds is unknown. Access restricted; please consult archivist. Subject to review under Freedom of Information and Protection of Privacy Act. 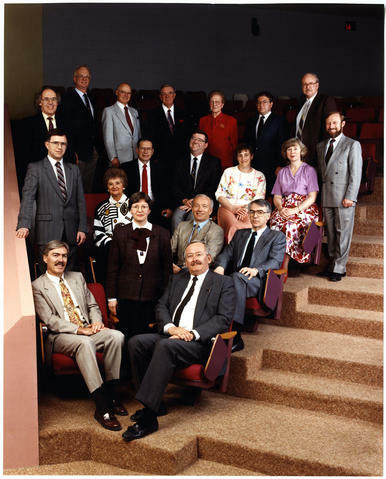 The image linked to this description (board_of_governors_1990-1991.jpg) is a group portrait of Nipissing University's Board of Governors for 1990-1991. The image is from the Board of Governors (Nipissing University) fonds, <a href="http://archives.eclibrary.ca/composite-photographs" target="_blank">file 0053-14</a>.